*There is disabled person’s parking space. 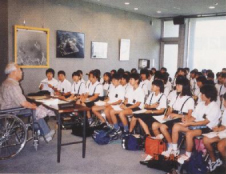 Since October 1994, Minamata disease survivors have volunteered their time as Storytellers (Kataribe) at Minamata Disease Municipal Museum to speak about their painful experiences. Their stories will help visitors understand about Minamata disease more deeply and encourage people to live strongly in any environment, like people in Minamata have lived strongly in spite of the adverse situation. There are 13 storytellers now. Their true stories and wishes for the future generations will have a profound impact on visitors. ■Please call before the 15th day of the month, one month before you would like to visit. For example, if you would like to visit in April, please make a reservation before March 15th. Your understanding is requested, since we draw up a schedule at the end of each month. However, you may ask even 10 days before your visit, since you may reserve if there are any vacant seats. If your visit is only for a Museum tour, you can apply even a couple of days before. ■Our storytellers are not always at our Museum. Please let us know if there is any change with the days and hours of your visit. ■At the exhibition room there are TV monitors being played for information. Feel free to ask any questions to our staff. Mr. Hamamoto lost his parents to Minamata disease, and his father’s body was autopsied. Mr. Hamamoto himself has been living in a wheelchair and dealing with difficulties. He struggled to make Chisso admit their responsibility for Minamata disease, while he was discriminated against for the suspicion of infectious disease and was in needy circumstances for lack of fishing income. He became the first storyteller (Kataribe) at Minamata Disease Municipal Museum in October 1994. He is now the President of the Storytellers Organization at Minamata Disease Municipal Museum. Mr. Sasaki lost his father to acute Minamata disease. This led him to be involved in the direct negotiation against Chisso for aid for the victims. He tells us about his challenges and the suffering of Minamata disease. He has acted as a storyteller (Kataribe) at Minamata Disease Municipal Museum since April 1997. He is the President of the Minamata Disease Patients Alliance. Mr. Hashiguchi fought against the suffering of Minamata disease, while he caught fish as a fisherman. He was the plaintiff group leader of the Third Lawsuit and has sought relief for the victims. He tells us about his challenging life. He has acted as a storyteller (Kataribe) at Minamata Disease Municipal Museum since April 1997. He is the Chief Secretary of the National Coordinating Committee for the Association for Minamata Disease Sufferers, and the representative director of NPO Minamata. Mrs. Ueno lost her husband to acute Minamata disease in 1958. Though she gave birth to a child in the same year, the baby died at the age of 2. She shares her life with us, during which she suffered and was discriminated against for Minamata disease. From 1973, she worked for “Meisuien” for 15 years, which is a welfare facility for the Minamata disease patients. She has acted as a storyteller (Kataribe) at Minamata Disease Municipal Museum since April 1999. 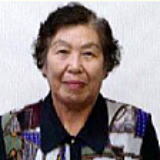 Mrs. Kawamoto’s husband, Mr. Teruo Kawamoto, was the head of the Chisso Minamata Disease Patients Federation and led the Minamata disease patients’ campaign. She tells us about her deceased husband’s efforts to help sufferers of Minamata disease and her family’s hardships. She has acted as a storyteller (Kataribe) at Minamata Disease Municipal Museum since January 2002. Mrs. Kaneko lost her husband to Minamata disease. Her first son developed Minamata disease when he was very young, and her second son died soon after birth. Her third son is a congenital Minamata disease patient. She shares her harsh life with Minamata disease with us. She has acted as a storyteller (Kataribe) at Minamata Disease Municipal Museum since January 2002. Ms. Yoshinaga’s father developed acute Minamata disease when she was 3 years old in 1954 and died 2 years later. Her grandfather, a fisherman, died in 1956 after he had been bed-ridden for 9 years. She has acted as a storyteller (Kataribe) at Minamata Disease Municipal Museum since October 2007. She was certified as an Environmental Meister of Minamata City in 2011. She narrates her experiences as a family member of Minamata disease patients and tells us the importance of having courage. She is President of the re-glass studio “Bin-no-kaze”. Mr.Nagamoto works for “Hotto-house”, which is a workplace for physically or mentally handicapped people. He narrates his life, hoping to have people understand the lives of Minamata disease patients and handicapped persons, and hoping Minamata will be a better city. Mr. Sugimoto’s family received severe discrimination when Minamata disease was considered as an infectious disease. When he caught fish with his disabled body, the fish did not sell at all. In spite of such needy circumstances, his family did not give up and he fought against the government, Chisso, and the social circumstances at that time. He has been certified as an Environmental Meister of Minamata City since 1998. He has acted as a storyteller (Kataribe) at Minamata Disease Municipal Museum since October 2003. Mr. Ogata applied to the medical care program of the Final Solution Scheme proposed by the national government in 1996; however, his application was rejected. Nevertheless, he repeated his objection and request for administrative grievance hearings. The judgment was reversed at the second request in 2006. He has acted as a storyteller (Kataribe) at Minamata Disease Municipal Museum since October 2007. He runs a door fittings store. He is the vice-president of the Storytellers Organization in Minamata Disease Municipal Museum. He was certified as an Environmental Meister of Minamata City in 2011. Mr. Kawamoto’s family member was a Minamata disease patient. His father was Mr. Teruo Kawamoto, who was the head of the Chisso Minamata Disease Patients Federation (he died in 1999). Mr. Kawamoto tells us about his grandfather, who died of acute Minamata disease, life in his childhood, his father who led support for Minamata disease patients and his mother who supported her husband’s activities. He runs a nursing home where he works as an occupational therapist and a speech therapist. He has acted as a storyteller (Kataribe) at Minamata Disease Municipal Museum since May 2008. Mr. Hajime Sugimoto’s family member was a Minamata disease patient. His mother was Mrs. Eiko Sugimoto, who acted as a storyteller (she died in 2008). He tells us his stories of the time when family members developed Minamata disease, his childhood life, his returning to Minamata City from an urban area, and his health. He is a fisherman and sells additive-free dried small sardines. He has acted as a storyteller (Kataribe) at Minamata Disease Municipal Museum since May 2008. Ms. Emiko Maeda has had Minamata disease since infancy. Her parents are certified Minamata disease patients. She tells us about her life before and after she developed Minamata disease, Myojin-Cho (in Minamata City) of her childhood, the games of her childhood, Minamata disease of her relatives, her school life, her youth and her current life. She has acted as a storyteller (Kataribe) at Minamata Disease Municipal Museum since May 2008.